Over the last few years I have been encouraged to write about different aspects of Freemasonry. When I researched The Hiram Key Series I was puzzled about the origins and history of the Craft and wanted to understand them. When I penned The Turning Series I wrote as a scientist who became a Freemason and enquired how I related to the Craft and could use my science to understand how it worked. 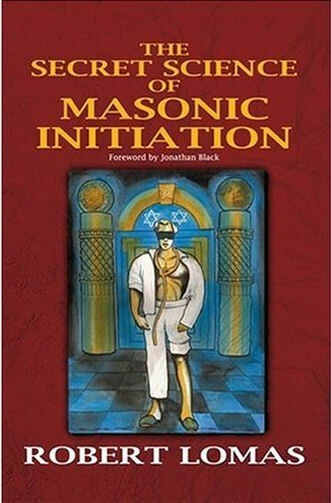 But this latest book, The Secret Science of Masonic Initiation, is totally different. It began as guide book for recently made Masons but developed into an investigation of an alternative world view. That world view was inspired by a man who died seventy years ago, in 1939. He was the founder of my lodge and one of the deepest thinkers about Masonic ritual it has ever been my pleasure to study. In the early twentieth century Masonic writers such a W L Wilmshurst, A E Waite and J S Ward wrote popular books about this philosophy. However, for the last fifty years the subject has been avoided by mainstream Masonic writers, afraid of ridicule. I decided to revisit it. My aim is to make Freemasonry more accessible to a new generation of seekers after the Truth. I am pleased to see that the new Dan Brown novel The Lost Symbol takes as its theme the Masonic philosophy of the search for that which was lost. Freemasons refer to this lost idea as The Masons' Word or The Centre, (the concept which Dr Robert Langdon calls The Circumpunt) and which has always been at the core of the esoteric teaching of Freemasonry. Perhaps Dan's fictional writing will encourage a new generation to seek the Truth which inspires it. And perhaps a cryptic clue to Dan's inspiration might be found on page 433 of The Lost Symbol. The first step to writing The Secret Science of Masonic Initiation began when a certain young man told me he wanted to join the Craft. I thought back to my own initiation and remembered how I had searched in vain for a book of instruction which would help me comprehend what I was struggling to understand. I remembered my disappointment at not finding any such book and I thought how the lack of any context drove me to begin the research which ended with the publication of The Hiram Key. At that time I wanted to know where Freemasonry came from, and it is a question I have returned to many times since. But over time I have come to realise that Freemasonry is more than the obscure mystery of its beginnings. It is a philosophy of living and a means of spiritual development which transcends its history and the scientific explanation of its dramatology. At the centre of the Craft lies a belief that it is possible to develop and improve your soul. But as a scientist I was not sure how to deal with the issue of the soul. My natural tendency is to think as a physicist. Let me show you what I mean. In an interview I gave to fellow physicist Dr Alex Nicolin about the influence of Freemasonry on the development of modern science I was asked a question which related to the soul. Here is that section of the interview. Alex Nicolin: Dr. Lomas, I've been discussing your interview with my collegues and I was pleasantly surprised to see that it steered a few energetic reactions. In particular, I noticed that some scientists would like to dissect (purely) cognitively the mysteries of the world around us, leaving no place for the soul. By putting their cognitive powers above their souls (that is somehow associated with an ever-lasting and most annoying uncertainty) they never doubt their results. In the words of the operative masons, they envisage Science as a church whose construction only goes forward. What they build one day is there the next so that they can go on with their work. There is no overnight collapse, no need to tailor the project, etc. And most importantly, no need for continuous self-sacrifice! Frankly, I feel this is ridiculous: I look at Science as being one big (multiple-scales) back-and-forth process whose only certainty is that it's never-ending. At the end of the career one may find his contributions insightful with respect to one scale but the overall picture (the truly difficult problem) remains un-scrutinized. Anyway, in the light of this feedback, I would like to append another question to our interview. The question is this: Dr. Lomas, as a scientist and a Freemason, how do you comment St. Paul's saying that he "dies daily"? As I see it the problem of measurement (in quantum mechanics) is how do the entangled states of many possibilities collapse down to just one observation and when does it happen?. Is it when the pointer on the dial moves, when the particle creates a path in the bubble chamber, when a charged particle hits the phosphor of a display screen, when the optic nerve of the observer pulses or when the self-conscious awareness of the observer registers the event has taken place? If you buy into the Everett-Wheeler proposition then collapse never happens, instead the whole range of possibilities all continue but your consciousness only perceives one of the outcome paths and the observer that is you splits as well. This implies each version of the observer sees one of the possible outcomes that the Copenhagen interpretation assumes is created by the wave function collapse. At each split a whole infinity of world outcomes is split off from your observation. Does this mean that your self-aware spirit is the self-conscious system which traces the path of highest probability through the range of possible wave function collapses? Which ever interpretation you favour then part of the world of possibilities dies each time you make a measurement. You either shed part of your spirit at each split or you many versions of you die and only one lives on to observe another event, when the whole process happens again. In the third degree of Freemasonry the ritual tells you. Part of you, the essential self-conscious observing you, either dies or is forever exiled down another world path every time you observe something, and so collapse a mess of entangled wave functions into a fixed state. As a physicist I find this the deepest mystery in postulating a theory of quantum cosmology. Do we, the observers, have to die each time we measure or observe, and is this the mystery which if solved will reconcile relativity with quantum wave collapse? We may have to die not just every day, but every time we make an observation. Alex Nicolin: I was expecting something "classical" related to self-sacrifice being the only way to spiritual enlightenment, a process that is never finished, etc. Your answer takes me, however, to quantum measurements. Incidentally, your way of looking at quantum measurements says a lot about your spiritual path. Most scientists I know embrace the theory of non-destructive (non-demolition) quantum measurements, i.e., they would choose a one-world one-fundamental-reality framework of QM, as to eliminate the soul from the discussion. But, your answer is very interesting, you speak about God, Order and Uncertainty and how nicely everything fits in the picture. Whilst this discussion was fascinating for two physicists, talking dirty about science, I am quite sure it will mean little to a lot of my Brethren. Freemasonry is a broad enough church to accept and foster my scientist's viewpoint, but I realize I am not typical. Few of my Brethren share my interest in science but we all share an interest in the workings of the Craft. If I was to share my insights and discoveries with both my newly made brethren and as many as possible of my fellow Masons I had to write within the shared symbolism and ritual forms of The Craft. My problem was how did I approach such a book, whilst remaining true to my scientific beliefs? Whilst pondering this dilemma I was granted inspiration. In the opening section of his book Jonathan said. This is a history of the world that has been taught down the ages in certain secret societies. It may seem quite mad from today’s point of view, but an extraordinarily high proportion of men and women who made history have been believers … I am asking readers to approach this text in a new way – to see it as an imaginative exercise. I want the reader to try to imagine what it would feel like to believe the opposite of what we have been brought up to believe. These few sentences inspired me to step back from my scientific position and write this book for a newly made Mason. I make this request to him and all who read it. Temporarily set aside science and to listen, as a child, to the ancient teaching of the Craft as it shows you how you might know yourself. If you do, this book will take you on an imaginative journey deep into that inner part of your consciousness that Freemasonry calls your soul. Using this inspired writing device I was able to set aside my scientific views and write about the spiritual and philosophical path which I have discovered within Freemasonry and try to help my younger brethren to find it for themselves. Using Jonathan's idea of treating my thoughts as an imaginative exercise encouraged me to write a guide which simply accepts the basic premise of Freemasonry. Working the rituals can improve your soul and teach you how to become a better person. This left me free to think about the ritual steps needed to bring this about. But it means the book is unashamedly a book of spiritual Freemasonry. You may have noticed that it is being supplied via Lewis Masonic, It offers little to the non-Mason. Indeed if you are not a Mason I warn you that the book is unlikely to appeal to you and I advise you not to bother reading it. It is totally different from any book I have ever written before. It assumes a complete knowledge of the ritual and takes for granted that any reader has experienced the degree workings within a regular lodge. It assumes you have been through the rituals and want to reflect and develop your understanding of their teaching. I developed the material in the book as a series of Masonic lectures, some of which I did for my own lodge and some of which I recorded for the Solomon Lodge of Research in Canada. Since then I have delivered each of its chapters as separate lectures in and around the lodges of West Yorkshire, and listened to the feedback. Beware, this is an indulgent and introspective book, but I do hope that it will serve to pass on to my younger brethren in the Craft, the joy and fulfillment I have experienced as a Freemason and help guide them on their own paths to the Centre. Turning the Hiram Key was written for the world, to try and change the public attitude to our Craft. The Secret Science has been written in particular for a newly made Mason who is very dear to me, to help him grow within the Craft but also for any of my Brethren in general who feel they might benefit from deeper reflection on the meaning and content of each of our degrees. I've tried to write a guide book for the Masonic pilgrimage through the degrees and offices of the Craft which I would have liked to have had when I first joined. And on the seventieth anniversary of the death of Walter Leslie Wilmshurst, I am pleased to be able to build on the foundations he so ably created.